From the pile of completed “Reader Surveys” postmarked no later than July 15, 2019, we will select two grand prize winners. 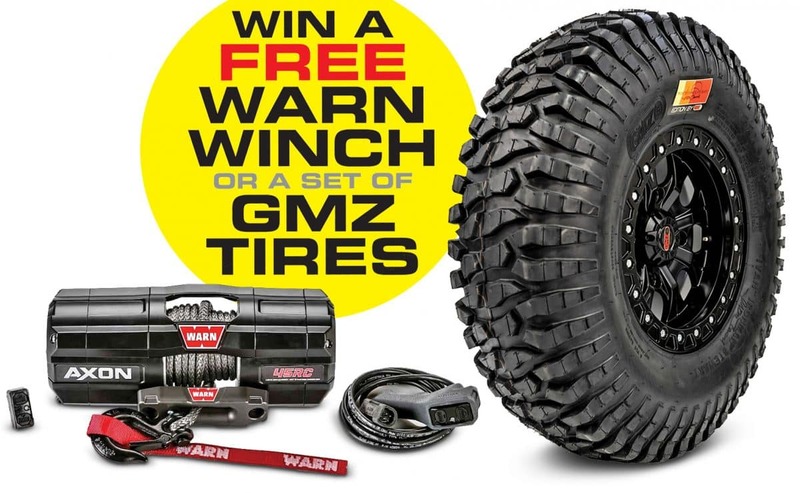 If you are a pure-sport or high-performance UTV driver, you could win a set of four GMZ Ivan “Ironman” Stewart tires for your machine. The eight-ply tires—influenced by one of the best off-road racers ever—are available in 30- or 32-inch sizes for 15-inch wheels. Utility, hunting and farming guys will have a shot at Warn’s latest AXON 45RC winch. This winch has a compact, sleek design that will fit any UTV. A sealed gear set, synthetic rope and digital corded remote feature the latest technologies in winching. No purchase necessary. Photocopies of this form are acceptable, but only one entry per person is allowed. Survey forms are to be submitted in your own envelope; any forms sent to us in the prepaid subscription envelopes will be disqualified. All entries become the property of Hi-Torque Publications, Inc. None can be returned or acknowledged. Winners will be determined in a random drawing from all entries postmarked no later than July 15, 2019. Entries must be postmarked first-class, one entry per envelope. Contest limited to continental U.S. residents only. De­cision will be final. The odds of winning will be de­termined by the total number of entries received. The contest is subject to local, state and federal laws and is void where prohibited. No substitute prize will be given, nor will cash equivalent be paid. In accepting the prize, the winners grant Hi-Torque Publications, Inc., the right to publicize and promote their photograph and the winning of the award. Employees of Hi-Torque Publications and their families are not eligible for the contest. Drawing will be held August 3, 2019. By entering this survey you give us the right to use your email address to send you offers pertaining to our magazine and it’s advertisers. © 2019 - UTV Action Magazine. All Rights Reserved.